One Swallow Doesn’t Make A Summer, But…. 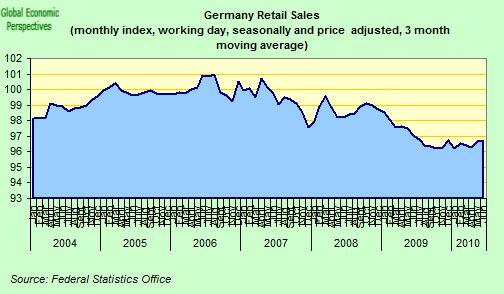 Well, as we all well know one swallow doesn’t make a summer, and one data point doesn’t swing an argument one way or another, but the latest retail sales PMI reading for Germany is far from being either uninteresting, or (for my part) surprising. 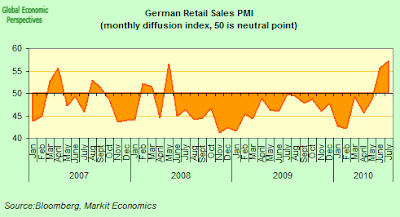 Basically after only two months (in the last twenty seven) of registering growth, the August PMI suggested that German retail sales once more fell back. And the anecdotal explanation for this: Spain’s victory in the world cup affected the shoppers appetite! Actually, from a long term aggregate point of view I think (and economic study would be a waste of time if it weren’t like this) that rather more factors come into play than football and the weather. August data signalled a modest decline in month-on-month sales, reversing the solid upward trend registered in both June and July. 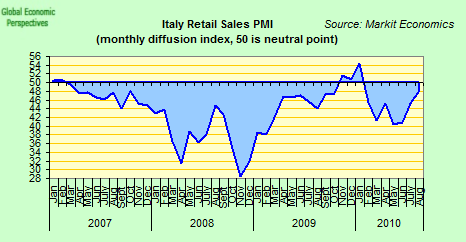 At 48.4, down sharply from 57.2 in the previous month, the seasonally adjusted Retail PMI was below the 50.0 no-change value for the first time since May. The latest reading was the lowest for four months and slightly below the long-run series average (49.1). Anecdotal evidence suggested that less favourable weather conditions and reduced consumer footfall had negative impacts on like-for-like sales in August. Some retailers also noted that the end of the football World Cup had contributed to a decline in household spending. 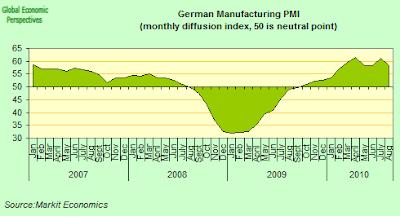 Of course, the retail PMIs are not an exact science, and they only give us an indication of the retail environment. 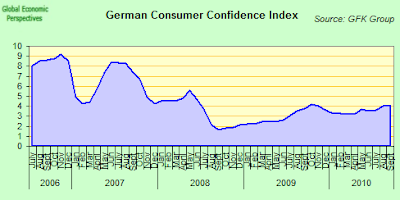 But their long term trend is not in disharmony with the actual sales data provided later by the statistics office, since sales in Germany have been generally trending down, and as the writers of the report say, the long-run series average (49.1) does show slight ongoing contraction . 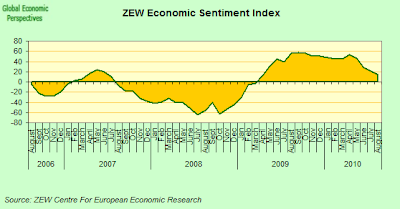 While the ZEW investor sentiment index – normally a forward looking indicator – has been dropping steadily for some months now. So if we combine this with the August flash German PMI reading (which dropped back slightly over earlier months), it would seem that some easing off of German GDP is taking place, and indeed few will be surprised by this, since the very rapid rate of Q2 growth was clearly a one off. The issue really is that these very rapid (Leo Messi in-the-box type) accelerations don’t seem to pass through to self-sustaining (via the consumption pillar) expansions, and I do wish more people would start to ask themselves why this is. Moving on to other parts of the Euro Area, French retail sales seem to have continued to grow in August, although at a rather weaker pace than in July. 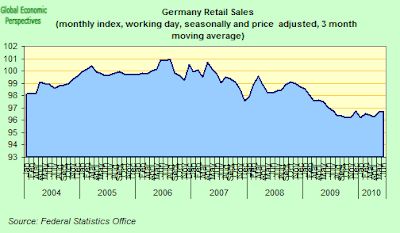 But whichever way you look at it French retails sales have a decidedly more positive look about them than their German equivalents. Although retailers were downbeat about their actual sales in August, latest data pointed to a surge in optimism about the prospects for sales in September. The degree of positive sentiment about the outlook for sales in one monthâ€™s time was the most marked since April 2008. Almost one-quarter of survey respondents anticipate sales to beat their initial forecasts. A number of retailers linked their optimism to improving conditions in the domestic economy. 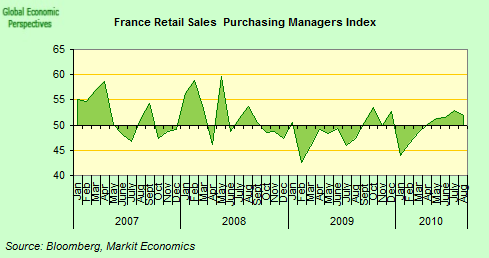 The value of goods ordered by French retailers for resale decreased for a second straight month in August. Panellists indicated that they preferred to take a cautious approach to stock decisions at the present time. Correspondingly, inventories declined at the fastest rate since January. One wonders what the basis for such expectations actually are. It couldn’t possibly be that they are being influenced by the press and media coverage of the situation, could it, since in neither case do I see the expectations as especially realistic. 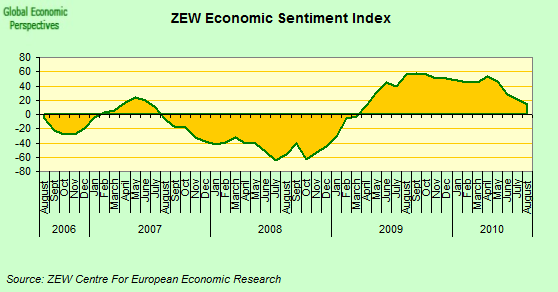 The French seem to be too pessimistic, and the Germans way too optimistic. 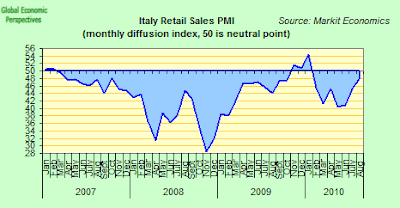 Meanwhile over in Italy it was plus Ã§a change, as retail sales continued their now customary decline (if at a rather weaker pace than in recent months), with the consequence that the Eurozone Retail Sales Index suggested that sales across the Euro Area fell very slightly in August (on aggregate). Well, all meat for Monsieur Trichet to chew on before Thursday’s meeting. You are a bit germanophob, right? And that is nothing new. Everything revolves around exports and export-related business investment. The same picture since 20 years or so. The explanation is quite easy: No wage growth in the last 15-20 years. The share of capital income is steadily growing, the share of wages shrinking. Why don’t you mention that? Isn’t it an obvious factor? IG Metall has promised to get higher wages now and to make a stand this autumn in the steel industry. But I am pessimistic, unions are quite weak nowadays.